But how do you find new clients for your office cleaning business? Start by driving down the main business districts or roads in your city. Get a feel for the different sections of town, where the factories are, the malls, the schools, the government buildings. Office parks and medical plazas are a good place to start. In our town, there is a busy strip where I often get stuck in traffic. I've had lots of opportunities to look around and see what types of businesses are located there. Nestled among the banks, the Whole Foods and CVS, down the way from the auto mechanics and the dermatologist offices, are small, accessible strip malls, where a sandwich shop and a wine store might open their doors in the same parking lot as a nail salon and a tutoring service. Large companies may seem like a better bet when it comes to job security. They tend to be stable and dependable. If the company is a familiar brand, you can have a good sense of who you're dealing with. You know that in case problems should arise, there would be a chain of command, or central management office you could locate to resolve issues. Small family businesses and offices obviously need cleaning and maintenance just as often—sometimes more—than large companies. What's more, it is often easier to get in the door of a small business. In large companies, you may have to make multiple calls to get in touch with the person who does the hiring. Not so in smaller, more accessible businesses. The office manager is frequently the one who greets you when you come in. He or she is often more immediately available, and may be just as interested in engaging your cleaning services as the big guys. Keep an eye out for mom-and-pop type businesses, such as a small Asian grocery store, or a watch repair shop. There are pros and cons to working for big businesses vs. small ones. Big-name businesses, if they outsource their cleaning and maintenance services, may not require it as frequently as small offices do. Often, they already have janitorial staff in place. But small offices can offer quick employment opportunities, and there is the added advantage of being able to deal directly with the office manager from the moment you walk in the door. It might be as easy as “hitting it off” with the person doing the hiring. All businesses are concerned with security, and their number one priority is to hire someone they trust. Home offices need cleaning, too! Increasingly, people work at home, an innovation made possible by our mobile workplaces and what some people are calling the new 24-hour workday. Electronic devices and apps such as smartphones and Skype allow many professionals to share work in real time, thus creating the opportunity for them to work wherever they are, whether that's a Starbucks down the street, or in their jammies on the sofa. This is a fairly new twist on the old theme of “cottage industries” in the American economy. Some people work full-time from home, and discover more time for their own work when they delegate the cleaning to an office cleaning service. For your client, it makes good economic sense. Say your client is a lawyer who can work five billable hours at $130 per hour. Why would she spend four hours cleaning, when keep working, and hire your cleaning service for one or two hours? She would save a briefcase-full of money. Be the best and keep your job! Unfortunately for your customers (but fortunately for you), there are a lot of slackers out there offering cleaning services. The turnover rate can be very high. Many office cleaning startups got their first jobs simply by walking into the right office at the right time, shortly after the last cleaning service was given the boot. Professionalism is required. When soliciting office cleaning jobs, keep the following points in mind to increase your chances of getting—and keeping—the jobs you want. Show up on time. Or be five minutes early. This may be a cultural norm, and it may be okay when you're late to a party. But it isn't acceptable to be late to your professional appointments. Interestingly, this is dependent on what country you live in. For example, in Japan, people who see they're about to be late to a meeting are more likely not to show up at all, rather than be shamed for coming late. Appearance counts. You may live in a town where the mayor has visible tattoos. Even so, wear long sleeves over your ink when meeting with office managers to offer your cleaning service. Minimize the attention drawn to those large earring holes. Brush your teeth and hair. Seriously! Not everyone does. We've seen it all. Dress in “office casual.” Google it. Deliver the goods—a professional service. Promise the best and follow through. Not only will you naturally grow an excellent reputation, your business will grow, you'll earn much more, and you'll feel great. Again, if you give it your best, you can get and keep the jobs you desire. Which jobs are those? The high-paying office cleaning jobs that are there for the taking right in your town. Go get them. 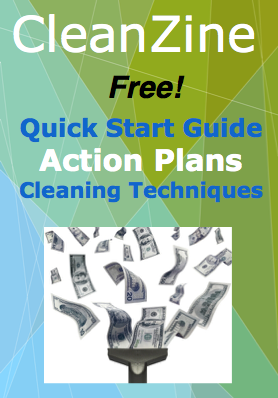 Learn about starting an office cleaning business.